With our decades of industry experience, we're confident we can meet and exceed your requirements when it comes to laser engraving, machining or cutting on wood. Our lasers are perfect for all kinds of creations, ranging from models to prototypes, as well as signage and decorative objects. 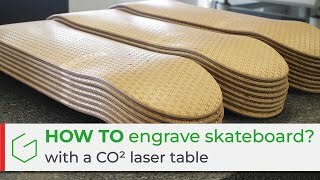 Gravograph offers the latest laser engraving and cutting machines for wood, as well as mechanical machines, suitable for various types of wood. Whether it be plywood, MDF, softwood or a hardwood, Gravograph offers the possibility of treating wood in any number of different ways. In order to guarantee the cleanliness of your work space and the wellbeing of your employees, we recommend the use of certain accessories, such as the chip collector, for mechanical engraving or machining, or an extractor for laser engraving and cutting.